If you’re a carnivore looking for a plate of [delicious] meat, I suggest you scurry over to Blue Smoke. A southern joint named after “the curl of blue smoke that rises out of perfectly smoked meat,” you will not leave this place hungry. When you walk into Blue Smoke you’ll see a door leading to the restaurant and one that leads downstairs… I saw a lot of people come in and just head straight to the JAZZ door so of course I was intrigued and ventured down to explore while I waited for Chelsea. 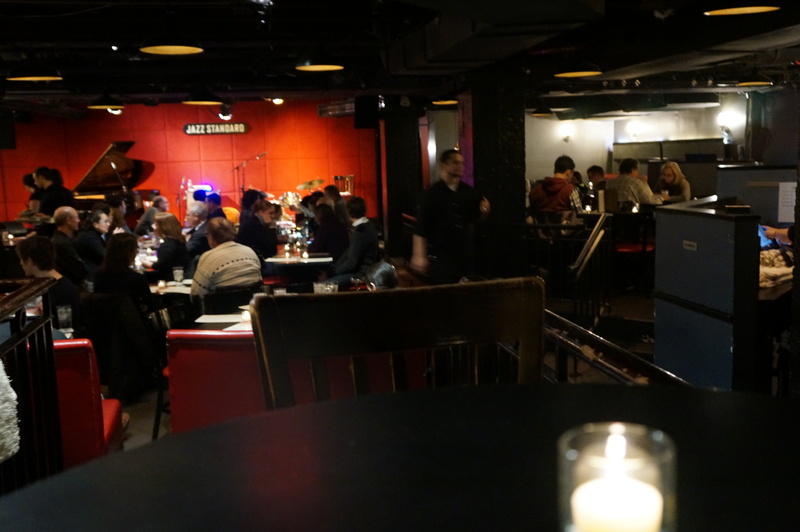 I found out that Jazz Standard is a music venue which serves Blue Smoke cuisine — you have to pay a cover for the show and make reservations in advance. Pretty cool, right? 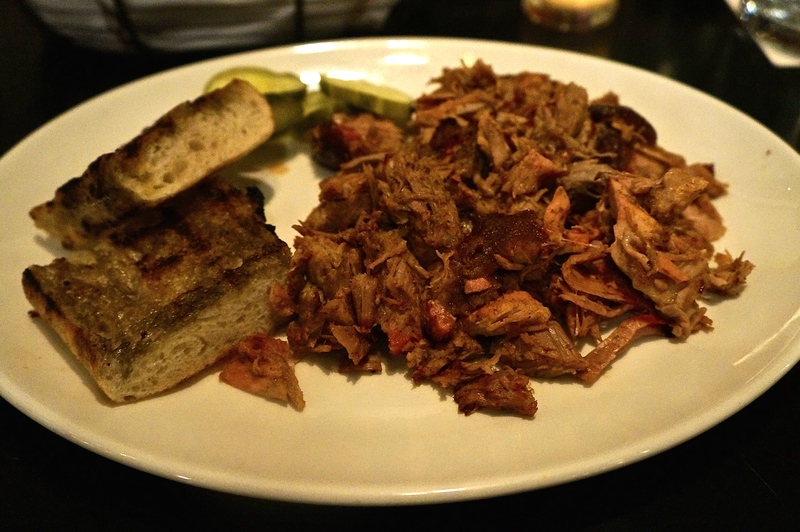 Upwards and onwards now to the FOOD… I went with the pulled pork…literally a plate of PULLED PORK. Tender, tasty, totally-not-vegetarian. HOWEVER. It was served with two slices of bread that appeared to be topped with something; it almost looked like vinegar. I couldn’t decipher the flavor, but told Chelsea it tasted familiar and asked her to try it. Ah grease. Hence the sense of familiarity of it. Anyways, that was slightly off-putting and I stayed away from the bread. But I didn’t come for the bread. I came for the meat. Pulled pork, four pickles and some sketchy bread. Chelsea was torn between the chicken & biscuits and the pastalaya (smoked chicken, homemade andouille sausage, orecchiette, trinity). Trinity is the base of Cajun cooking: onions, bell peppers and celery. (Thanks Google!) 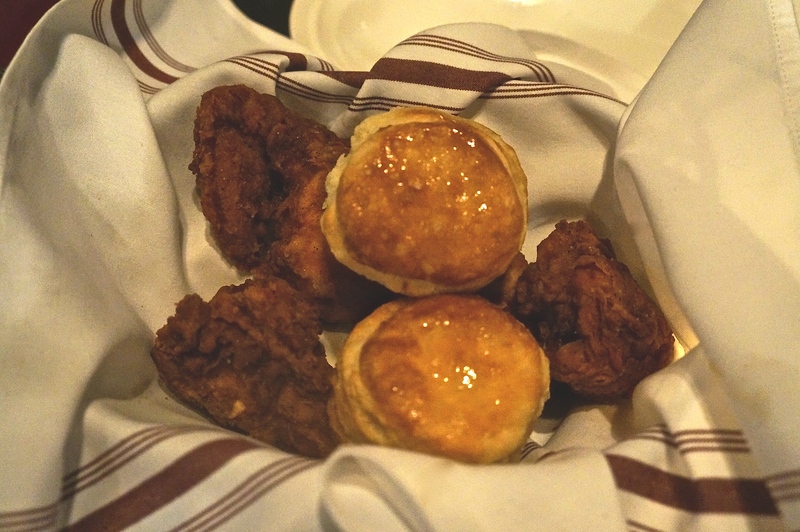 Our waitress recommended the chicken & biscuits, claiming it may be the best chicken she’s had in all of NYC so naturally Chels went with that. Pastalayaseeyalater. The biscuits were BUTTERY and delicious. Chicken was a mix of dark and white meat – really crispy and tasty. Chelsea says Root & Bone’s C&B dish is better though. 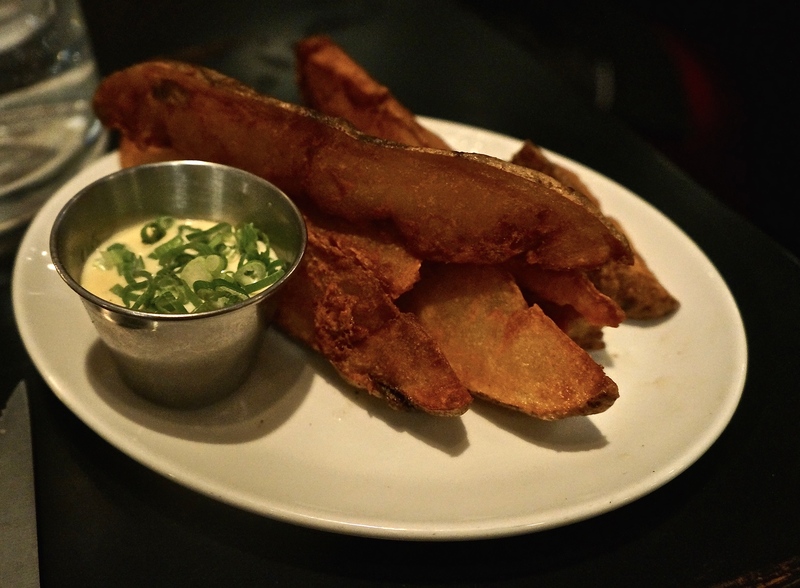 We also shared an order of steak fries with garlic-lemon mayonnaise. The crispy ones were the best. Overall, a thumbs up for Blue Smoke y’all. Oh, the folks next to us got an order of the cornbread madeleines which I’d have to recommend just based off of the second-hand delicious smell of them. You’re welcome.